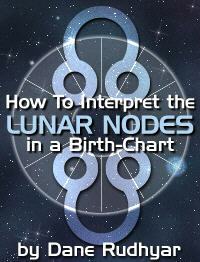 This two-part article is an excellent guide to the Lunar Nodes in astrology. Part One explains the significance of the Lunar Nodes in birth-charts, and Part Two explores the 19-year transit of the Moon's nodal axis around the birth-chart. The zodiacal position of the Sun, the Moon, and the planets are in astrology the factors upon which the main burden of interpretation rests. They are considered as mere points having a precise celestial longitude; that is, they are located on certain degrees of the zodiac. They may make aspects to each other which are said to refer to more or less specific events. But astrology deals also with other factors which, while considered of less importance, nevertheless may be revealing, in a more general and more psychological sense, if properly understood and used. One of these factors is the nodal axis of the Moon. Very often, astrologers speak only of the North Node, whose zodiacal position is listed in the ephemeris. But, as I have pointed out repeatedly, to consider the North Node without paying attention to the South Node makes little sense. The Moon's nodes are the two ends of the line of intersection of the plane of the orbit of the Moon around the earth and of the plane of the ecliptic, which is the plane on which the Sun seems to move around the zodiac throughout the year — that is, actually the orbit of the earth around the Sun. Two planes which do not coincide and are not parallel must intersect. The line of intersection of the solar and lunar planes is the Moon's nodes' axis — the Dragon's Head and the Dragon's Tail of traditional astrology. In Part One of this article, I discussed the meanings of the North and South Nodes, pointing out that these meanings are complementary and must always be considered together. If the North Node is in Leo, the South Node must be in the opposite sign, Aquarius; if the North Node is in the first house of a natal chart, the South Node must be in the seventh house. What I am to discuss here is the fact that the zodiacal longitudes of the Moon's nodes change every day. The nodal axis has a retrograde motion — i.e., its zodiacal position is displaced "backward," in the sense opposite to that of the Sun's and the Moon's motion in the sky. Thus, the nodes move from Aries to Pisces, to Aquarius, etc. They move at the rate of about three minutes of an arc a day, and the nodal axis circles around the whole zodiac in about 18.6 years. This cycle is very important for various reasons. It has a direct connection with the eclipse cycles. Eclipses, solar and lunar, occur when a New Moon or a Full Moon takes place in the vicinity of the zodiacal degrees occupied by the North and the South Nodes. A cycle of 19 years exists — the Metonic cycle — which refers to the return of the New Moon to the same zodiacal degree. There is also a Saros period, stressed by Chaldean astrologers, which refers to the recurrence of an eclipse in relation to its actual visibility on the earth's surface. This Saros period contains 223 lunar months and includes 70 eclipses: 41 solar and 29 lunar. Every 18 years 11-1/3 days, an eclipse belonging to a particular Saros series occurs; it occurs 120° of geographical longitude more to the west (because of the third of a day — the third of the daily rotation of the earth). Thus, in three Saros cycles (i.e., 54 years, one month, and one day), an eclipse recurs at about the same geographical (but not zodiacal) longitude. If it is a solar eclipse, its path across the surface of the earth will be found several hundred miles farther north or south in geographical latitude. Eclipses, however, are special cases in the study of the Moon's nodes; and what we are concerned about just now is the regular and constant cyclic motion of the nodal axis in 18.6 years. The first point we should consider is the retrograde character of this motion. We know that all planets have periods during which they also have retrograde motion. To understand what this means astrologically, we have merely to realize that only the Sun and the Moon are always "direct" in their motion in the zodiac. As the Sun and the Moon symbolize the two polar aspects of the life force operating on our globe, we should logically deduce that a retrograde motion is a motion representing an activity in a direction opposite to that of the life force. Generally speaking, "life" is a forward movement intent upon generating a future which not only maintains but also transforms a present state of organic development so as to actualize further what was potential at the beginning (the seed) of the organism. But there are factors in man which can only develop in "counterpoint" to the normal, instinctive, spontaneous flow of life energies. For instance, as long as mind is the servant of the life force and of the will for survival — as it is in the animal kingdom — it is instinctual and bound to immediate biological needs. It displays no sign of objectivity, no capacity for abstraction and reasoning. To be objective to some fact and to gain the proper perspective concerning it, one must move away from it and look at it, as it were, from a distance. If Mercury represents basically the mind of man, it is, therefore, when Mercury is retrograde that man's objective discriminative and analytical mental powers begin to develop adequately. A retrograde Mercury does not mean a slow or ineffectual mentality, but a mind which is seeking to gain a new and detached perspective on life events and instinctual drives. In a somewhat similar manner, the Moon's nodes represent a type of development in man's total personality (psychological as well as physical) which brings to this personality a variety of things which the natural-biological spontaneous and instinctual trends of life of themselves would not produce. I stated in Part One of this article that the North Node is the point of "intake" and the South Node that of "release"; I also said that the nodal axis is often called the "axis of Fate," that it "deals with the relationship in depth of the individual to his environment." But such a relationship in depth has its roots in the past. We may think of this past as the ancestral genetic past of the individual person or as the cultural and national tradition which has formed his youth and his mentality. Or we may conceive this past as the unconscious memory of "past incarnations," as the unfinished business of previous existences. The main point is that the Moon's nodal axis can be associated with the inrush (North Node) of factors which have their roots in some kind of collective or individual past and with the release (South Node) of what has resulted from the assimilation or the non-assimilation (i.e., the waste products) of these factors. This process of intake and release is rhythmic and cyclic; it acts in the background of the individualized ego consciousness. Thus, we can speak of it as "Fate," in the sense that the ego-will has nothing to do with it; it can only react to the upsurge (at the North Node) of fateful (or, let us say, "karmic") developments. It can react in such a way as to block the coming to the surface of consciousness of these developments. If it does so, it is because of fear, insecurity, or of total involvement in routine affairs and technical procedures. In his recent book, Religions, Values, and Values, and Peak Experiences, well-known psychologist Abraham Maslow points to the fact that many people demonstrate a resistance against what he has called "peak experiences" which tends to upset the status quo of the personality. Indeed, what gives to an occurrence the character of "fate" is often our refusal to accept it readily — to "take it in"; it turns destructive, if not immediately, at least when the cycle reverses or repeats itself. A "reversal" takes place when the North Node has moved half a circle around the zodiac — i.e., when it comes to the position occupied at first by the South Node. This takes around nine years, and the 9-year cycle is well-known in numerology. The 19-year cycle can also be extremely significant. The nineteenth, thirty-eighth, fifty-seventh, and seventy-sixth years bring to many individuals challenges of reorientation of their outlook on life and of their responses to basic factors in their personality. The Moon's nodes' cycle lasts 18.6 years and the Metonic cycle of New Moons' recurrence at the same point of the zodiac lasts 19 years; thus, the close of the nineteenth, thirty-eighth, etc., years is crucial in terms of the soli-lunar factors — that is, of the basic direction of the flow of life energies. In my own case, my nineteenth year saw the publication of my first book and musical compositions and a meeting which resulted a while later in my emigrating to America — also a remarkable restoration of health seriously impaired in early adolescence. During my thirty-eighth year, I also recovered from a temporary illness. A situation developed which led just after I was thirty-eight (twice nineteen) to a move which changed my life and because of which I met a person, aged 19, with whom 9 1/2 years later I became engaged. Then also I began to write for the first popular astrological magazine — a start which has affected my life ever since. During my fifty-seventh year, it became necessary for us to leave New York; this led to another crucial change in our life just as I was 57 (and my wife ending her thirty-eighth year) — a change which led to divorce two years later. My seventy-sixth year is still in the future (1971-72) [Editor's note: these years mark a time of great success and recognition for Rudhyar and his work]; but nine years after my 57th birthday, I left for a second and lengthy trip to Europe which brought most important results personally as well as professionally. My book, Fire Out of the Stone: A Reformulation of the Great Images of the Judeo-Christian Tradition, which I had started after beginning my fifty-seventh year, was published first in French, then in English nine years later. I might add that 9 1/2 years after 19 means 28 1/2; and the 28th birthday is often most decisive. I spoke of it long ago as "the second birth" or "birth in individuality" — the first birth being the physical bodily birth. 28 is four times 7; and the 7-year cycle is basic in the development of the biopsychic human organism. 7 times 9 equals 63, the age at which the 7-year and the 9-year cycles precisely interact. What happens around the sixty-third birthday (usually a little before, but also soon after) normally determines to a great extent what the last part of the life will be — the quality of it, even if not the actual events. One can consider a birth-chart as being divided into two halves: the North Node hemisphere, which begins with the zodiacal degree of the North Node and extends following the retrograde direction of the nodes; and the South Node hemisphere, extending from the South Node to the North Node, counting backward in the zodiac. Let us take as an example the interesting case of President Truman - born May 8, 1884, with the 17th degree of Libra rising and the North Node at 21°48' of Libra. In this case, the nodal axis and the birth horizon nearly coincide which tends to show a life controlled by fate or destiny — that is a life in which the present is directly a consequence of the past or, again, a life controlled by karma. Let us not forget that there is a racial-national karma as well as a personal one. After Harry Truman's birth, the North Node moved "backward" along the upper half of his natal chart — a half in which we find all planets except the Moon. This Moon, however, rules the whole chart, as it is in the first house and it rules the tenth house. Venus (ruler of rising Libra) is in the lunar sign, Cancer. This made of Truman an opportunist with a remarkable capacity for adaptation to public situations — and, most likely, with a strong mother complex of one kind or another (and there are many kinds). At the end of August, 1893, Harry Truman was in his tenth year and the nodes had reversed their positions, the North Node being where the South Node was at birth. Late in December, 1902, and again late in July, 1921, the North Node returned to its natal place. We shall consider only the last-mentioned return, for it is then, at the age of 37, that Truman's political life really began. He became a county judge in 1922 with the help of the Pendergast political machine which ran Kansas City and the county; in 1926, he was elected "presiding judge." In the 1932 elections (when F. D. Roosevelt rose to national power), Truman tried in vain to become governor of Missouri. The transiting North Node was in the natal South Node hemisphere, the South Node passing through the natal North Node hemisphere and over Uranus (late April, 1932). In 1934, at the request of Pendergast, Truman ran for the U.S. Senate and was elected as the transiting South Node moved through his natal tenth house and was about to reach his natal Jupiter. He was "releasing" in his new public function the capacities he had built through the years of his judicial career, close to a political machine. He worked hard, followed consistently the New Deal line, and stood firm when the Pendergast machine was investigated and broken up. He was reelected in 1940; he was then in his fifty-seventh year. The North Node had returned to its natal place in mid-March, 1940. This new nodal cycle was to be the crucial one. Then came the organization of a Senate special committee for the investigation of the national defense program. As its chairman, Harry Truman obtained national fame and prestige; and in the summer of 1944, he was picked by the Democratic Party as its candidate for vice president. In view of Roosevelt's health condition, this fourth term of his presented the probability of Truman's becoming president of the United States. This happened all too soon (April 12, 1945), less than three months after the new administration was sworn in. The North Node was on that day at 13°23' Cancer, very close to Truman's midheaven (18°41' Cancer) and to the midpoint of the arc between his natal Venus and Jupiter (16°02' Cancer). He was re-elected in 1948, in spite many predictions he would not be. Interestingly enough, the South Node was then on Truman's dominant natal Moon. There had been a solar eclipse exactly on his natal Sun on the preceding May 9; and another, near his natal Moon, came on November 1 — which shows that solar eclipses can mean an intensification of the natal planet they touch, for Truman's Moon rules his tenth house and his public status. The contact between the transiting South Node and this Moon released what had been built up while the North Node was moving through the North Node hemisphere of the chart, dynamizing most of the chart's planets — the last contacts being with the natal Neptune and Sun (January-February, 1948). Interestingly enough, the North Node had moved over Truman's natal Moon in July-August, 1939 — at the time of the Russo-German treaty which set the stage for Hitler's invasion of Poland, the beginning of World War II. Actually, even if indirectly, it was World War II which brought Truman to the presidency and gave him the awesome responsibility of ordering the use of the atom bomb over Japan. Much can be made in most cases of the transit of the nodal axis through two opposite houses. The indications thus obtained do not supersede the basic significance of the natal house positions of the nodes, but they introduce a temporary focusing of deeply rooted forces within one's unconscious forces referring somehow to his culture's or his past — in the specific area of human experiences represented by the houses. In President F D. Roosevelt's birth-chart, the North Node is in the third house at 5°41' Sagittarius; thus, the nodal axis is close to the natal meridian. This is another instance of a destiny-controlled life, but one in which the emphasized factor is that of the use of power — power built in at the nadir (private life and personal integration) and released at the zenith (public life and professional integration). FDR's father died when he was nearly 19 — an event which presumably began a new phase of his life — as the death of a parent in youth very often does. He married Eleanor on March 17, 1905, when his North Node had just crossed his 11 1/2 Virgo ascendant; and he was admitted to the bar when his North Node passed through his natal eleventh house — a house related to the lawyer in Mundane Astrology. When he reached the New York Senate, the North Node was passing through his ninth house — the house of expansion. When World War I started, it was in his sixth house; he then became Navy Undersecretary. The South Node moved over his Uranus and his ascendant during the preceding winter, perhaps referring to developments in his personal life. The nodal axis was linking his second and eighth houses in August, 1921, when he was a stricken with polio. It certainly forced him to tap his innate resources (second house) and to release them in a long process of self-regeneration (eighth house). He returned to politics in 1928 as the North Node passed through his natal tenth house; and when he was elected governor of New York, the North Node was on the second degree of Gemini and about to cross his four heavy planets in Taurus (Pluto, Jupiter, Neptune, and Saturn). He was elected president in November, 1932, when the North Node was at 14° Pisces — the nodal axis being, thus, nearly identical to his birth horizon. The South Node reached his natal Uranus close to the time of his nomination at the Democratic Convention, releasing as it were the transforming potential of this revolutionary planet. During early 1942 — nine and a half years later — the North Node came to the President's natal ascendant — during the darkest days of the war in the Pacific against Japan, but also when the idea of the United Nations was being born. In Part One of this article, mention has been made of contacts between the transiting nodes and the natal planets. These can often be shown to bring out into the spotlight the types of activities represented by the planets. A North Node transit should bring to the individual relatively new challenges. Powers which belong to humanity at large or potentialities inherent in his personal nature but as yet unactualized are then asking for recognition and use. The South Node transit may bring a more spontaneous and effective release of these powers but also may confront the individual with their negative aspects or with the outcome of their use. The effect of a transit of the nodal axis is especially noticeable, I believe, when it occurs on a natal planetary opposition, for then the two (or more) planets in opposition are touched. For instance, Charles de Gaulle, president of France, had at birth an opposition of Mercury to the great Neptune-Pluto conjunction which was to be completed a year or so after his birth — November 22, 1890. Last fall (1965), the nodes stirred this opposition, the North Node touching the Neptune-Pluto conjunction in early Gemini. This manifested as a loss of prestige in the December elections, even though he was finally re-elected, largely because his opponent aroused no popular confidence. But it should be noted also that the nodes had returned to their natal places in May, 1965, for he is now 75. Perhaps a new phase of his life has begun which will witness a change of consciousness — either in this body or out of it. When Lyndon Johnson became president, the South Node was conjunct his natal Uranus — just as was the case when FDR was nominated for the presidency in 1932. But this Uranus was at birth in opposition to Neptune and Venus; and these two planets were transited by the North Node in August and late September of 1963. Thus, in some mysterious way, the process which raised him to the presidency may have begun a few months before — perhaps after Kennedy lost his baby son. In October, 1966, the nodal axis will reach the place of our President's natal meridian; and this would occur before, in July, if his midheaven is 22° Taurus. It should challenge his capacity to lead and effect his prestige. Copyright © 1966 by Dane Rudhyar.